I'm revisiting my very first post. It was a story about feel good soup and the past few days definitely called for one of those feel good moments. My little guy came down with the flu the other day and he was just miserable. 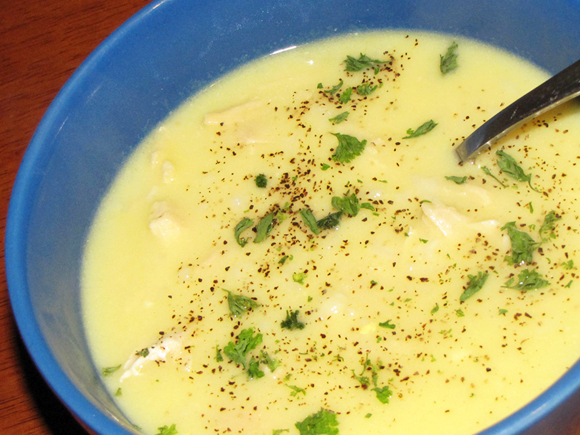 When he finally got to a point of wanting to eat, I made him his favorite soup: Chicken Lemon Rice. I always forget how much he loves it until it's made and he pretty much inhales it. This past time was no different considering how sick he was. It's always hard to see little ones like that because there's nothing you can do but comfort them and hope they're better fast. Sometimes that comfort can be found in the form of food. My son had barely eaten anything for almost two days - and there's nothing better than nice, warm soup when you feel awful - so I cooked up a batch. There were about two days where no one in our house slept but we made it through and I'm happy to say that my little man is just about back to normal. He's back to the constant, "Mommy, Mommy, Mommy...;" he's back to being the hilarious kid that he is; he's back to ignoring everyone for his trains; and he's back to defying the toy pick-ups. People tend to take most little things for granted (even the annoying ones) - but I'll tell you, I'll take a toddler that doesn't listen over one that's sick any day! 1. In large pot, cook chicken breasts in 1 TB butter until juices are clear. Remove from pan. 2. In same pot, melt remaining 6 TB butter. Stir in flour and cook over med-low heat for about 5 minutes or until slightly golden in color. 3. Slowly add chicken broth, stirring continuously, and bring to a boil. 4. Shred chicken into small pieces and add to pot once it has boiled. 5. Beat 5 egg yolks with lemon juice in separate bowl. 6. Temper the egg mixture by adding a little broth and then slowly add to pot, stirring continuously. 7. Add rice and simmer for about 20 minutes or until slightly thickened.